Pizza is our unofficial national food. As Americans, we are simply obsessed with it! But not all pizza looks the same. In fact, the pizza we eat here in the United States can look different from town to town. Some pizzas have a very thin crust, some very thick, some you have to fold, some you can’t even pick up. 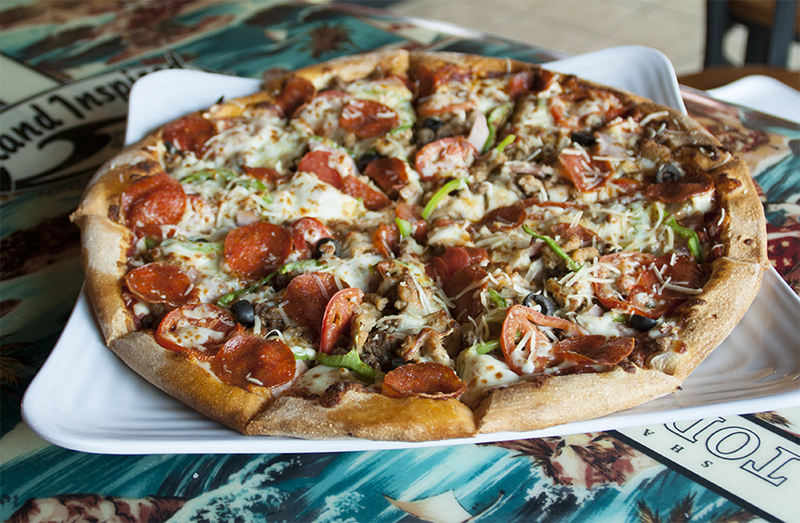 Ultimate California Pizza has created a pizza environment that allows you to order one of our gourmet signature pizzas or build your own by adding your favorite toppings to our hand-tossed crust. We have five locations across the Grand Strand and Myrtle Beach so great pizza is close to you. National Pizza Day is Sunday, February 10, 2019, let’s take a look at some of the different pizzas from around the world. Starting in Italy, generally believed to be the birthplace of pizza, the Sfincione New Year’s Pie is most relatable to Americans’ thick-crusted Sicilian pizza. 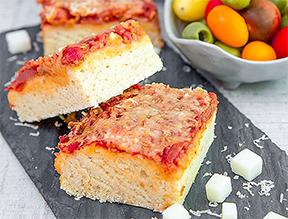 Translated loosely, sfincione means “thick sponge” Sfincione Pizza is a thick, spongy crust topped with bread crumbs, onions and a dry, crumbly cheese called caciocavallo. This pizza is actually considered a special treat and is normally served on the feast of San Giovanni, Christmas Eve, New Year’s Eve and Good Friday. In Poland, they serve Zapiekanka Bread. 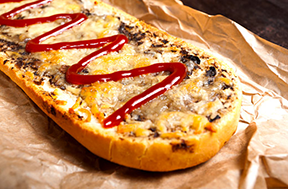 This “pizza” resembles an open-faced sandwich served on a baguette and topped with cheeses, mushrooms and drizzle of Polish ketchup. It is often common place to see other ingredients like feta cheese or olives added to the top of the pizza, but there will always be ketchup. (In Poland, it is less about the crust, cheese and the sauce and more about amount and type of toppings.) The ketchup in Poland is of course a bit different than what we use in the United States. It can be sweet, spicy or tangy and usually isn’t quite as thick. The next offering comes from Japan. 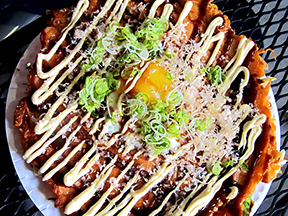 Okonomiyaki is a popular pan fried food that consists of batter and cabbage but the toppings really come exactly as the consumer wants it. While it normally contains anything from meat and seafood to wasabi and cheese, “okonomi” literally means “to one’s liking”. This picture shows the traditional Japanese pie topped with Aonori (seaweed) and Katsuobushi (fermented tuna) and is often paired with savory sauces like shrimp, yam or kimchi. Before we make a turn back to how we eat pizza in the States, let’s look at one from far to our south. Fugazza from Argentina is a pizza that closely resembles focaccia bread (a flat oven baked Italian bread). 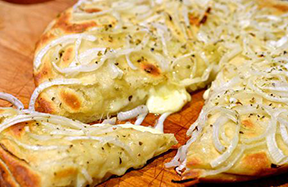 It is a dough that is usually topped with caramelized onions, oregano and sometimes mozzarella cheese before it is fire-grilled to a crispy and chewy perfection. The beauty of the pizza we get to eat in the United States is that we get a combination of the best parts. We have Chicago Deep Dish, New York Pie, and don’t forget the upside down pizza from Detroit. Of course at Ultimate California Pizza, we are partial to our brand of pizza. We cater to all personal tastes. We offer traditional hand-tossed pies, but with our Build Your Own Pizza option, there is something for everyone. We have 8 different sauce options, 10 different cheeses, 18 different meats, 16 different vegetables, fruits, nuts, and herbs to build your own pizza. Vegan or Gluten Free? We have that too. We have a pizza for everyone!